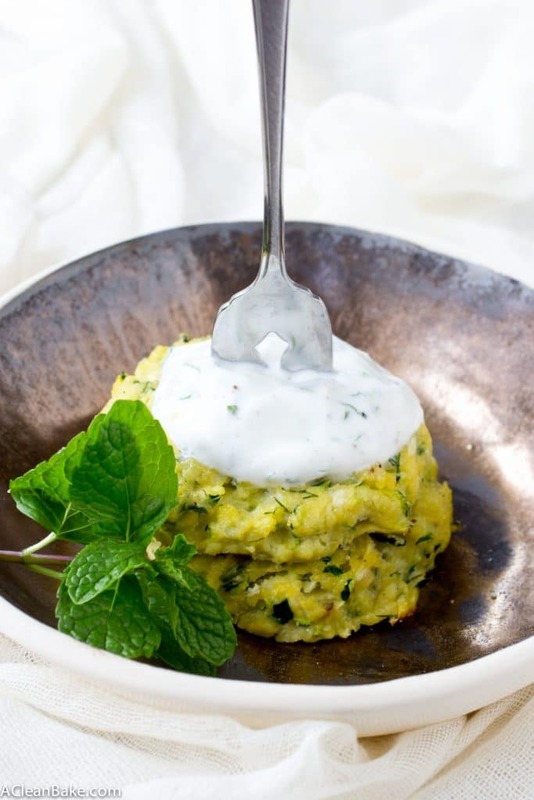 These Turkish zucchini pancakes are made from zucchini and coconut flour, for a healthier, unfried take on the Turkish dish Mucver. They’re low carb and taste great! 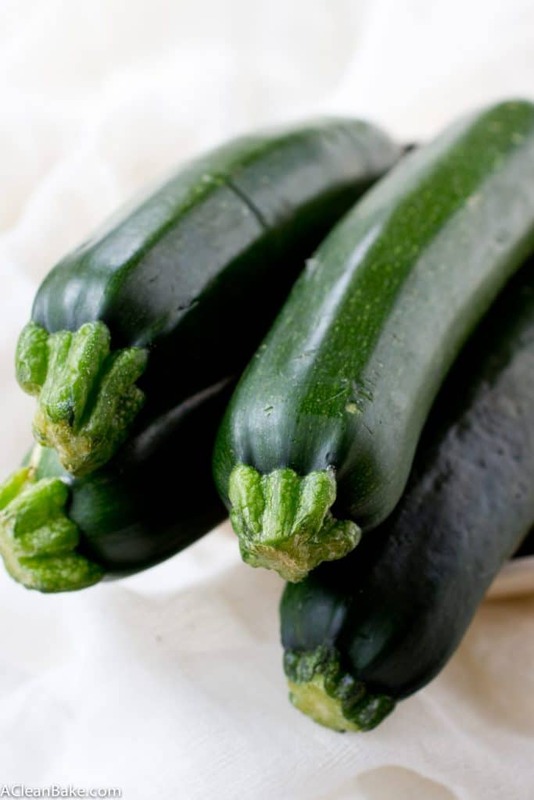 Everyone talks about all sorts of ways to sneak vegetables into things and while vegetables in desserts don’t always need to be the center of attention (because who leads with zucchini when there are two types of chocolate involved? ), I say let’s give them their moments to shine. Nor do vegetables have to be diet food or rabbit food or summer food or covered with butter to work. These zucchini pancakes are a perfect example of how a fresh, light vegetable can go hand in hand with a filling and comforting winter-friendly food. Though they are hearty, these pancakes are not heavy. The traditional recipe – or at least the way I have had them before – typically contains a generous portion of feta cheese. My version eliminates the cheese in favor of extra herbs and spices to make them so flavorful that cheese would actually be overkill. Plus, this version is grain-free, baked instead of fried, and contain a half serving of veggies in each pancake. Preheat the oven to 350. Line a large baking sheet with a nonstick pad or parchment paper or tinfoil lightly coated with nonstick spray and set aside. In a large bowl, stir together the zucchini and onion. Add the almond and coconut flours and stir to evenly distribute throughout the mixture. Repeat with the dill, salt and pepper. When everything is evenly mixed, stir in the lemon juice and egg. Portion the batter into 3 Tablespoon balls spaced 2 or more inches apart on the prepared baking sheet. Use the palm of your hand or the back of a flat spatula to press into a disc about 1” thick. While the pancakes are cooking, make the dipping sauce by using a fork or whisk to combine the remaining ingredients (yogurt, spice and lemon juice). If it appears to thick, dilute with water, ½ teaspoon at a time, until the sauce reaches your desired dipping consistency. Serve pancakes hot or cold alongside a bowl of the yogurt sauce for dipping. 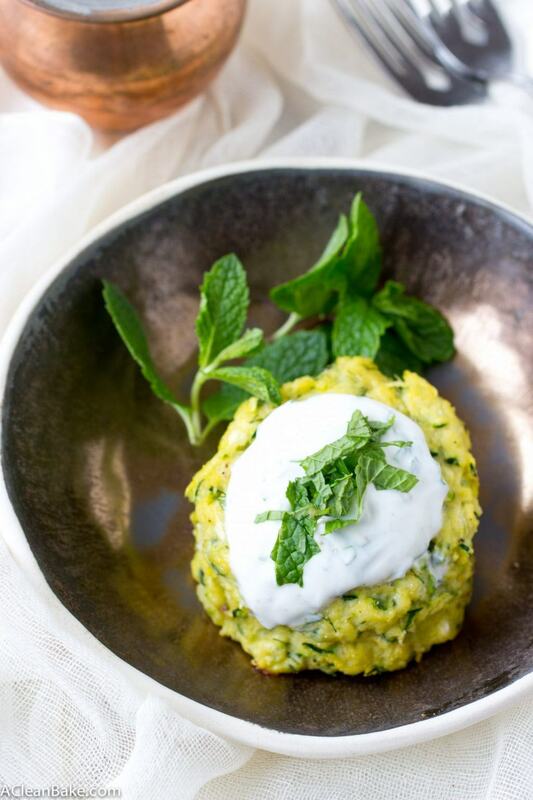 Optionally, garnish the pancakes with a dollop of sauce and some fresh mint or dill. The baking method alone will not create the golden brown crust that makes veggie pancakes so pleasant to eat. To do this without heavy frying, place the prepared patties into a preheated, greased oven-safe pan. Cook for 1-2 minutes on each side until golden on the outside. Then transfer the pan to the oven until the patties cook through. Hearty, but not heavy, healthy pancakes are the way to go! Your pancakes look scrumptious, Nora. I’m headed over to your guest post right now. Thank you for sharing, my friend! Thank you so much, Stacy! I hope you enjoy them and have a chance to check out the rest of The Collaboreat! It really is an awesome site. Thanks, Medha! Isn’t it so refreshing to see bright green this time of year? I am all about eating as many veggies as possible! Love these pancakes. Definitely a great way to incorporate veggies into every bite! Oh my these photos are just gorgeous! I seriously was staring at them for a solid 5 minutes…your lighting and focus is awesome!! Oh and this recipe, love. I just headed over to see the process/ingredients and loving the nutritional profile/simplicity! I just need to get some amond flour and this is so happening! Aw, thank you!! I was lucky to have a day of good light in between one dreary day and the next (the norm here this time of year). I hope you get to try these and you love them as much as I did! Oh hearty!!! Ok I need to go check why the recipe is Turkish! I am always looking to see what cultural ingredients make a recipe. Haha that’s a great question, Zainab! It’s a really common Turkish dish/preparation, but if you wanted to make it even more Turkish, you could add some sumac, which is a spice that is commonly used in Turkish cuisine (at least the stuff I’ve had :))! What a great dish for a nice light lunch. I love Turkish food and have been missing Istanbul as of late. It also makes a fabulous side dish for dinner, too! I am with you – Turkish food is a favorite of mine as well. I’m drooling over these! I love that you made them healthy and gluten-free. 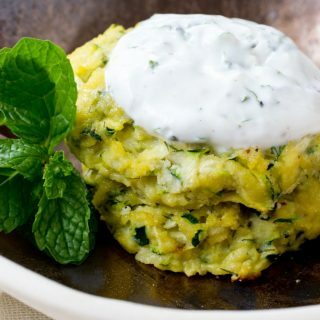 I’m all for giving zucchini it’s moment to shine!